CBS News first reported this month on the hazing and humiliating of local employees and other serious breaches of ethics and policy by civilian security guards during wild parties at the U.S. Embassy in Kabul, Afghanistan. Turns out, the State Department was warned that things weren’t right at the embassy, but nothing was done. Now there are troubling questions for the man once in charge of investigating those problems, reports CBS News correspondent Sharyl Attkisson. As inspector general for the State Department, Howard Krongard was supposed to be an independent watchdog. It was his job to investigate the very type of misconduct alleged at the U.S. embassy in Kabul: forced sexual hazing of guards, contract fraud and waste of tax dollars. 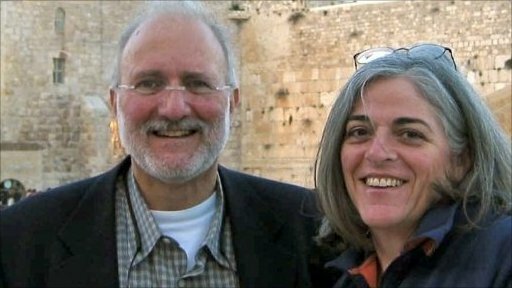 CBS News has learned that serious allegations about the embassy reached Krongard’s office two years ago – where they apparently vanished into thin air. How that could’ve happened is even harder to explain when you consider who made the complaint: Sen. Joe Lieberman, head of the Homeland Security Committee. His staffers say they notified Krongard’s office about security and fraud allegations made by high-level whistleblowers from inside ArmorGroup, the company that provides embassy security. But CBS News has learned Krongard had a special and controversial link to the company he should have been policing. His brother Buzzy, former executive director of the CIA, was on ArmorGroup’s board of directors. 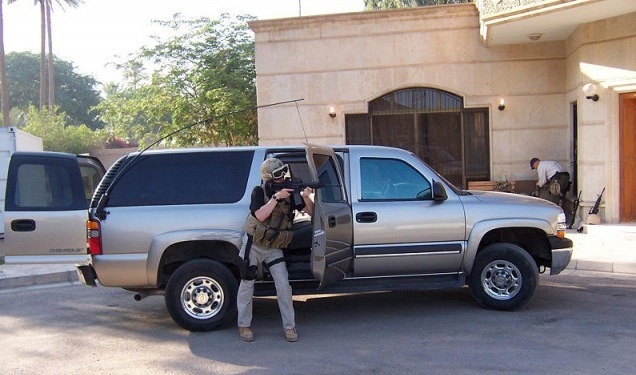 primarily by decreasing the number of contractors needed to support the embassy’s operations. BAGHDAD — Less than two months after American troops left, the State Department is preparing to slash by as much as half the enormous diplomatic presence it had planned for Iraq, a sharp sign of declining American influence in the country. 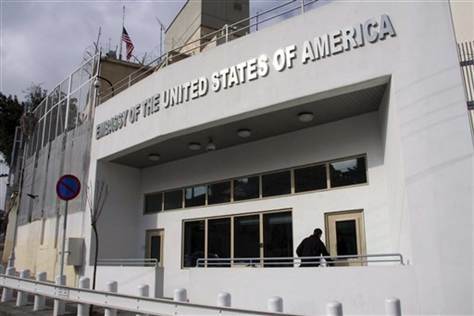 Officials in Baghdad and Washington said that Ambassador James F. Jeffrey and other senior State Department officials are reconsidering the size and scope of the embassy, where the staff has swelled to nearly 16,000 people, mostly contractors. The expansive diplomatic operation and the $750 million embassy building, the largest of its kind in the world, were billed as necessary to nurture a postwar Iraq on its shaky path to democracy and establish normal relations between two countries linked by blood and mutual suspicion. But the Americans have been frustrated by Iraqi obstructionism and are now largely confined to the embassy because of security concerns, unable to interact enough with ordinary Iraqis to justify the $6 billion annual price tag. The swift realization among some top officials that the diplomatic build-up may have been ill-advised represents a remarkable pivot for the State Department, in that officials spent more than a year planning the expansion and that many of the thousands of additional personnel have only recently arrived. Michael W. McClellan, the embassy spokesman, said in a statement, “over the last year and continuing this year the Department of State and the Embassy in Baghdad have been considering ways to appropriately reduce the size of the U.S. mission in Iraq, primarily by decreasing the number of contractors needed to support the embassy’s operations. The State Department on Monday suspended operations at the U.S. Embassy in Damascus, Syria, and pulled all its staff, including Ambassador Robert Ford, out of the country. The State Department cited the recent surge in violence for its decision. “Bombings in Damascus on December 23 and January 6, has raised serious concerns that our Embassy is not sufficiently protected from armed attack,” the State Department said. 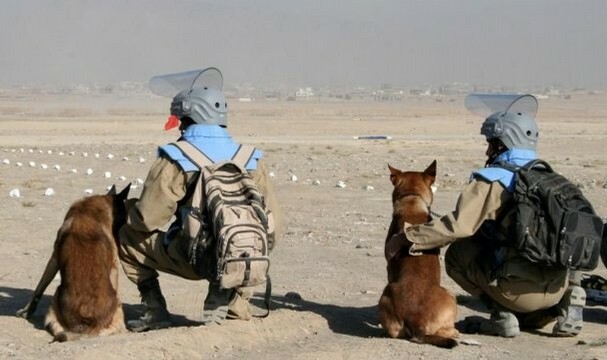 Today, the U.S. Department of State established a new Bureau of Conflict and Stabilization Operations (CSO) to focus on conflict prevention, crisis response, and stabilization activities. The bureau will subsume the Office of the Coordinator for Reconstruction and Stabilization (S/CRS). For more information, please visit www.state.gov/g/cso. The State Department can often times be so inward looking that it fixes the facts based on the policy need, making reality fit the vision whether that naughty reality wants to or not. Sometimes it’s funny, sometimes it can be tragic. When I arrived at my second Provincial Reconstruction Team (PRT) in Iraq, we were told to call the area we worked in the “Sunni Triangle of Death.” The meme was “Look at us bad boys, reconstructing the nasty Sunni Triangle of Death. It proves State is not a sissy.” About six months later we were told to stop calling the place the “Sunni Triangle of Death,” because since we had been working for half a year, we needed to show some progress. “Triangle of Death” did not signify progress so the Embassy banned the term to fit the policy meme, even though nothing had really changed. No real harm done, I guess. Around election time, the initial plan was for PRT staffers to observe the March 2010 voting up close, mostly so the Embassy could claim the election was legitimate based on the happy-talk reports we understood we were to file. That was part of the warp, but the real kicker was that to show our faith in Iraqi security, we were told we were not to wear body armor at the polling stations. The Embassy felt that photos of us all geared up, as we believed we needed to be based on local security conditions, would not play well with their PR campaign that all was well. There was a lot of back channel grumbling, and a few threats to refuse to observe, and the Embassy quietly just changed plans and canceled most of the rural observations. Again, narrowly, no real harm done. 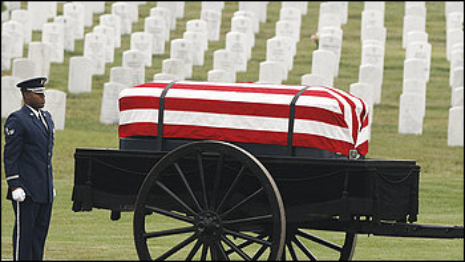 President Obama confirmed on Oct. 21 that the remaining 39,000 U.S. troops will leave Iraq at the year’s end. 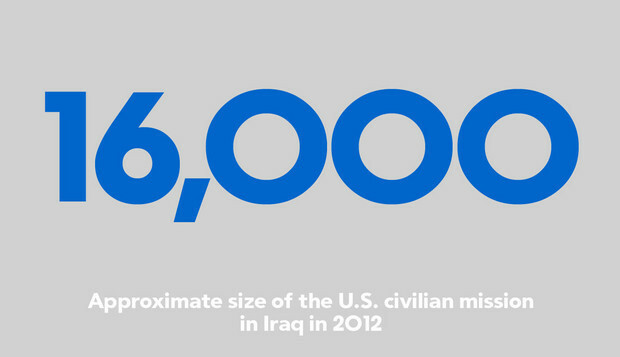 The war may be ending, but the size of the U.S. embassy in Iraq will double, from approximately 8,000 to 16,000 people. This is uncharted territory for the State Department; it has never managed a mission this size before. The Obama administration is requesting $3.2 billion to cover the transition from civilian to military control, in addition to a core operational budget of $496 million. 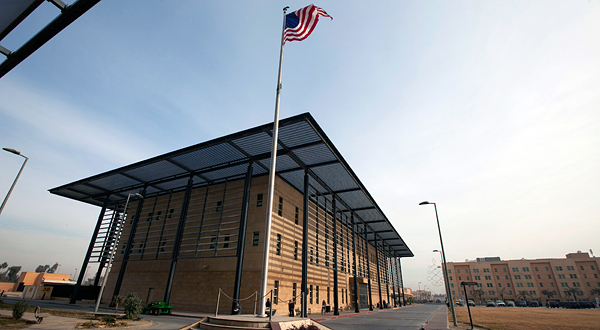 The embassy in Baghdad is a sprawling fortress, the largest the U.S. has ever built. Three provincial posts in Basrah, Erbil and Kirkuk will extend the U.S.’s diplomatic reach into northern and southern Iraq. But roughly ten percent of this team will actually include diplomats. In addition to their traditional work, the State Department will assume over 300 activities that the U.S. military routinely performs, including air transport, force protection, medical aid and environmental cleanup. And 5,000 security contract employees will protect the roughly 1,700 American diplomats as they attempt to pursue U.S. policy and development goals in an immensely complex country where two explosions in a Shiite neighborhood in eastern Baghdad killed 17 civilians on Oct. 13, Turkish troops are fighting the Kurdistan Workers’ Party in the north, and an eager Iran watches from the east. All of this adds up to a new experiment in U.S. statecraft. Whether this civilian-run operation is too bloated, on target or under-resourced remains to be seen — but its successes and failures will help steer U.S. post-conflict strategies for decades to come. WASHINGTON — The State Department is sending dozens of American contractors to Libya to help that country’s fledgling efforts to track down and destroy heat-seeking antiaircraft missiles looted from government stockpiles that could be used against civilian airliners. The contractors, weapons and explosives specialists, are part of a growing $30 million American program to secure Libya’s conventional weapons arsenal, which was ransacked during the fall of the government of Col. Muammar el-Qaddafi. American and other Western officials are especially concerned that as weapons slip from state custody, they can be easily sold through black markets to other countries, fueling regional wars or arming terrorist groups. Analysts are particularly worried about the dispersal of the SA-7, an early-generation, shoulder-fired missile in the same family as the more widely known Stinger.